National Girls Programming Contest-2018 was held on 22nd October 2018 in Daffodil International University. A total of 105 teams from 50 public & private universities participated in that contest. Two teams from LU Computer Science & Engineering Department also participated in that program. 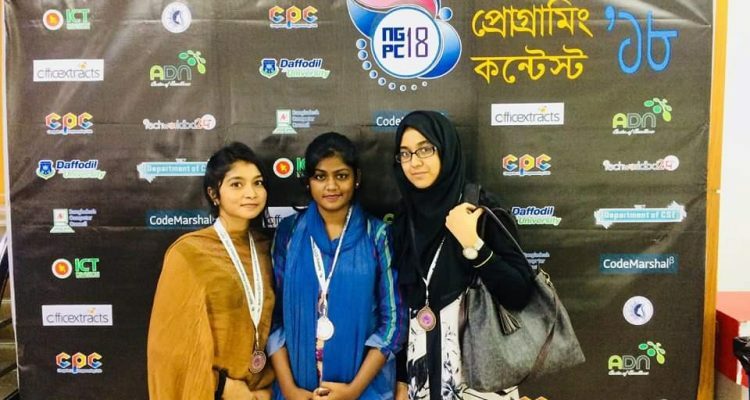 Team LU_Pangling_Dointers (Anika Tasin Chowdhury, Ayesha Akter & Jamiya Alom) stood 2nd position among all the private universities, 9th among all public and private universities and 11th position among 105 teams. Team LU_invisible solved 2 problems and stood 89th position. Prof. Dr. Syed Akter Hossain, Head, Department of Computer Science & Engineering, Daffodil International University congratulate both team of Leading University personally for their performances in recent National Programming Contests. Congratulations team LU_Pangling_Dointers for there performance.